Suspended Between Laughter and Tears is an exhibition of video, photography, installations and archived materials from the estate of the late Dutch-born and California-based conceptual artist Bas Jan Ader, who is assumed to have perished at sea in 1975. The exhibition’s title refers to the artist’s exploration of the tenuous point between comedy and tragedy in his work. It is the first museum survey focusing on the breadth of his artistic practice mounted in the United States in over 10 years. 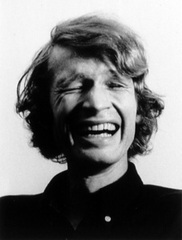 Yet it was Ader’s unique relationship to the city of Claremont, where he lived and studied from 1965 to 1974, which established his importance as a California artist. At his Claremont home, which was located a few blocks from what is now the Claremont Museum of Art, Ader executed some of his most significant works including All My Clothes (1970) and Fall I (Los Angeles) (1970). In his Claremont studio he also produced the experimental installations Please Don’t Leave Me (1969)Reader’s Digest Digested (1970). His thesis exhibition at Claremont Graduate University in 1967 laid the groundwork for his mature works, as seen in the offset lithograph invitation to the show depicting Ader sitting on the roof of his home smoking a cigar with cartoon-like clouds and sky behind him. Invited artists who provide a current context to Ader's work are Piero Golia (Naples/Los Angeles), Martin Kersels (Los Angeles), Gonzalo Lebrija (Guadalajara), Jed Lind (Montreal/Los Angeles), Kate Newby (Auckland), Thiago Rocha Pitta (Rio de Janeiro), Fernando Sanchez (Los Angeles), Sebastian Stumpf (Leipzig), and Diego Teo (Mexico City).